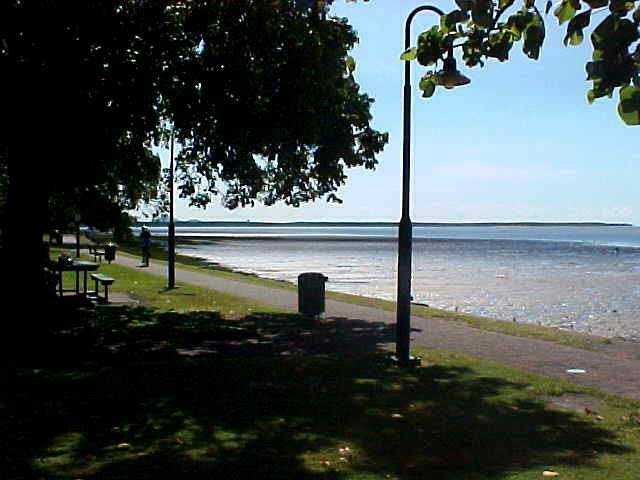 I got a ride from Norm Brice all the way to the up-north city of dullness, Cairns, where I met up with Vivianne again, stayed with Anne Falconer and her family in Edge Hill for the night and almost learned myself some Maori songs and Polynesian dances during a barbecue party. It was two days ago when Norm Brice told me he was going to go to Cairns on Thursday. �Really? Would there be any chance�?� �Of course,� he said. 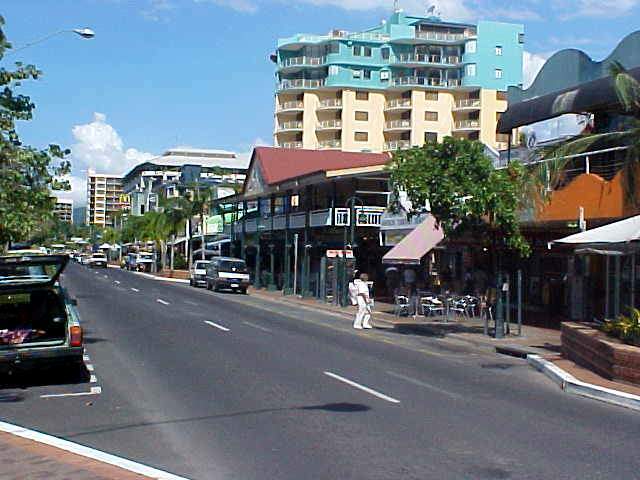 I knew my new laptop would arrive anytime now in Townsville, but why shouldn�t I try to get a feeling of big city Cairns for a day? Norm would return back to Townsville on Friday and he told me I could easily join in both rides. 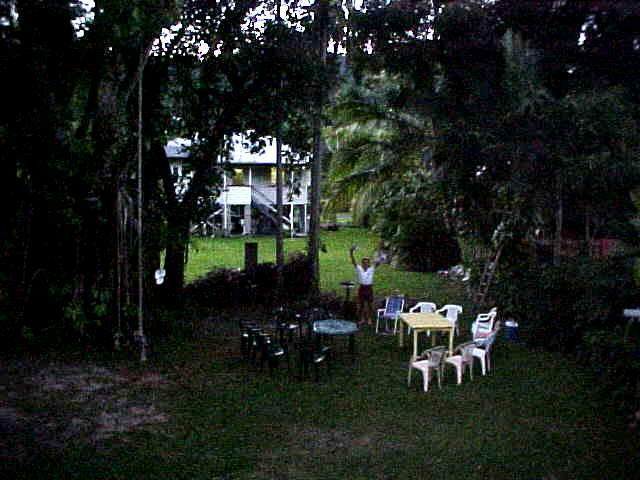 I contacted one of a few people in Cairns who had invited me to stay at their place and arranged my bed for the night. Today I had to wake up very early. Together with Val and Norm I had cereal breakfast at 5.30 am as we all had to catch the ferry departing from Magnetic Island at 6.30. 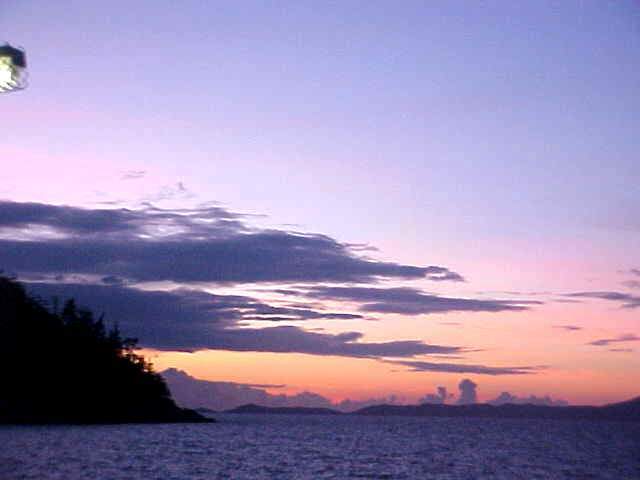 On the ferry I had a great view on the rising sun, marvellous! 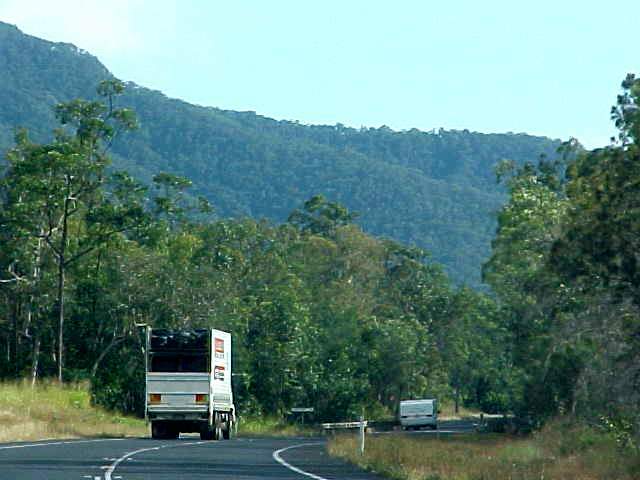 After picking up Julie Brice and dropping Val at the Brice Engineers office in Townsville (Val �runs� the place, she says, and Julie came along with us) we headed up north. Norm and Julie had to meet one of their clients who was being very fussy about a construction site in Cairns and they had to find out what the fuss was all about. On the 350km road to Cairns, on the Bruce Highway, we drove through endless patches of sugarcane fields on the right side and gum tree forests on the left. 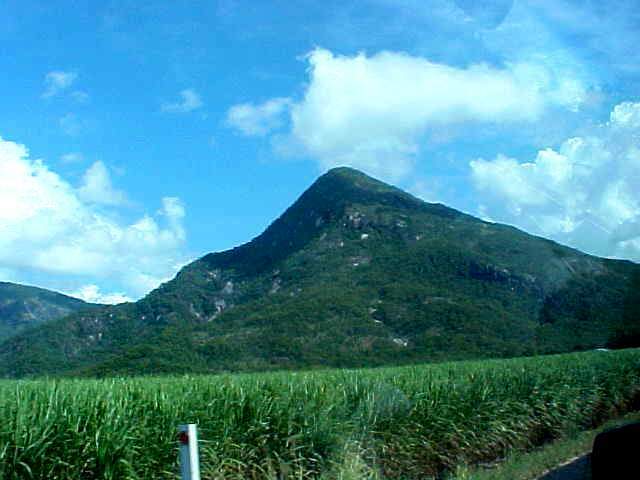 I saw a zillion of pin-pointy pyramid-like hills (which Australians call mountains), enjoyed the view on Hinchinbrook Island and we passed little towns with names as Rollingstone, Bambaroo, Tully, Mission Beach and Innisfail. �At your right you see the Pacific Ocean and at your left you see the Great Diving Range,� would be all a tour guide would say on this tour. Behind that green mountain range lays the big dusty Australian sandpit. We arrived in Cairns around 11.30 and it was all right for Norm to drop me at the General Post Office in the city centre. That was exactly were I had to be. My backup-team and friends used the GPO-address to send me all kinds of stuff too. I expected this hectic place at the post office, where it would at least take a few hours to get mail that was addressed to me, but instead I just had to type in my name in a computer and select my mail. That was easy. My mail was gathered and I had to show my ID and sign for a big package from Malaysia. 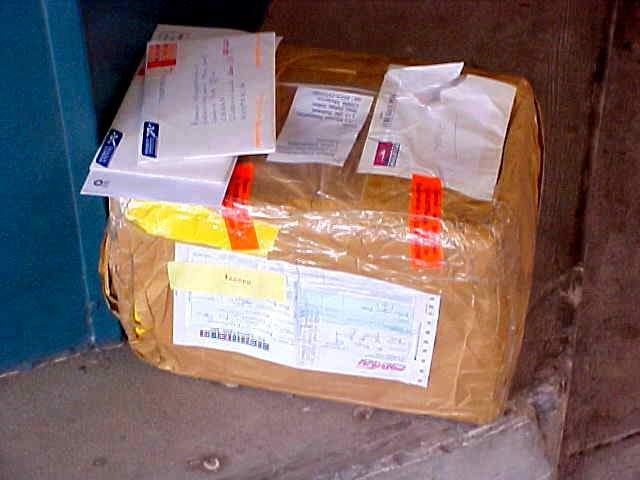 A package from Malaysia? Huh? 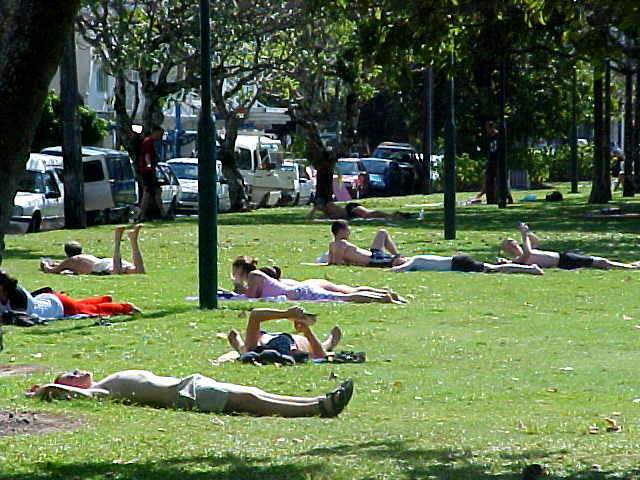 I sat down on the grass of the Esplanade in Cairns and was a bit surprised that Cairns had no beach or whatsoever. The tide was out and I only saw this endless stretch of mud for over a mile. How romantic! I opened the box and discovered that Aircoast.com had sent me a pair of shoes. 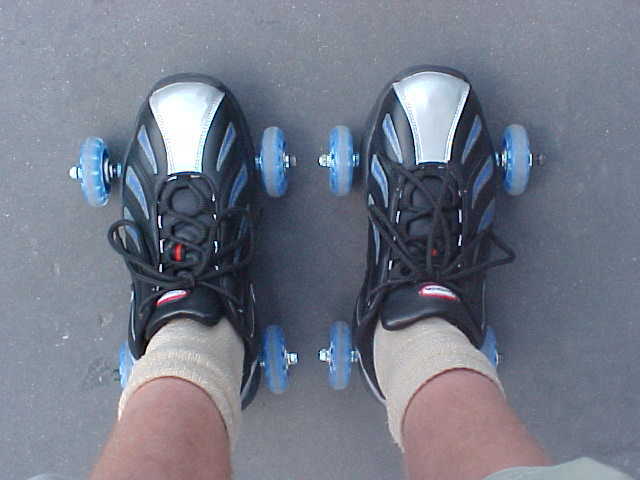 No, not ordinary shoes, but ones with attachable wheels! That was amazing, I had never seen anything like that before! 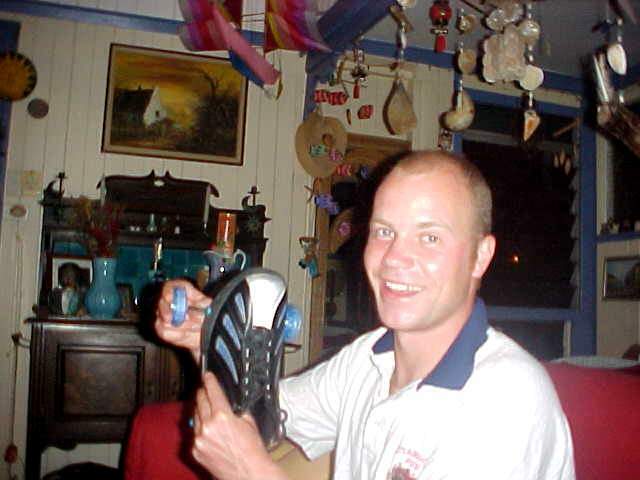 They were prototypes of a newly developed shoe and I was one of the first people in the world to try them! What an honour! 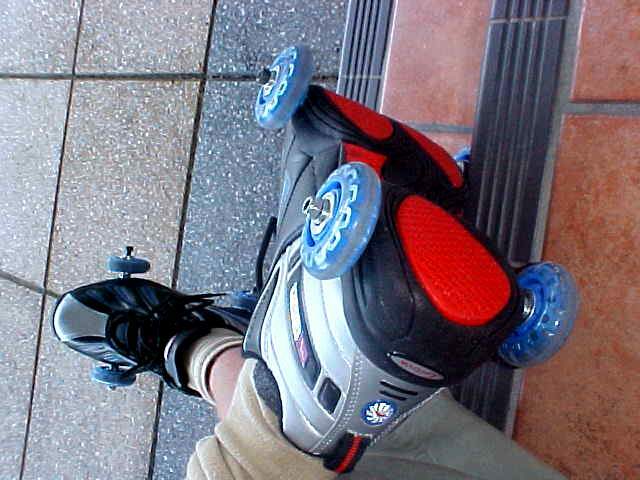 The size was good, the wheels were scary (I know how to rollerskate and I have inline skates at home, but I had never worn shoes where the wheels stuck out from the side!). Of course there was quite some audience when I made a few moves and tried skating around with them. Japanese tourist photographed the shoes and wanted to try them on too! Now I just had to find a way to take them along in my journey. I strapped the laces together and hung them dangling on my backpack. My hostess in Cairns had to work until 4pm today, so I had a walk through Cairns and found out it was a pretty dull place. The centre was easily covered on foot, even though it was tropical hot. Cairns is a Mecca for Queensland�s travellers (however competing with Townsville), a tropical hub to explore the Far North peninsula of Australia, the place where everyone from five-star guests to caravan park dwellers and backpackers come to see what the excitement is all about. 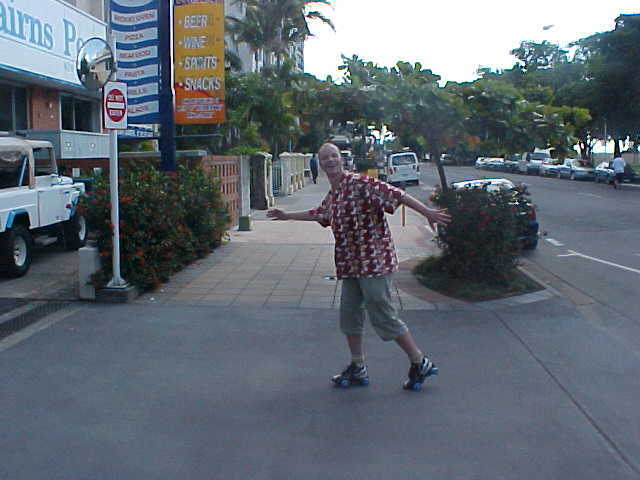 Well, there isn�t much excitement in Cairns. 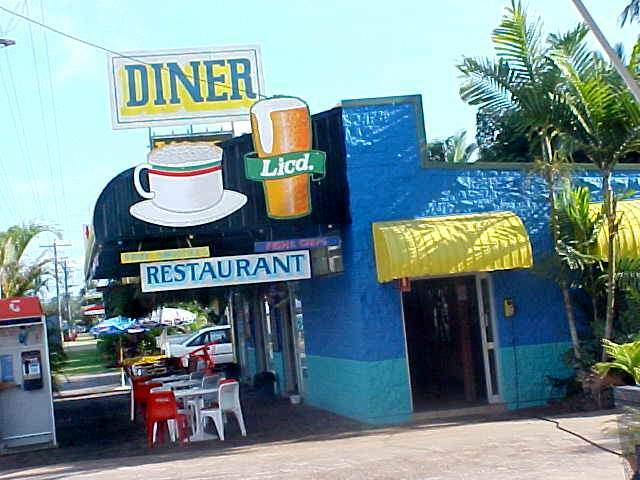 There is much out here, like the Daintree Rainforest up north, the Great Barrier Reef in the east, and the Atherton Tablelands in the west, but the city itself hasn�t very much to offer besides tourism shops (unashamed and excessive tourism with didgeridoo�s all over the place! ), restaurants and nightclubs. I hadn't seen so many hostels, tour operators or touts since the Costa Brava in Spain, and a worryingly large percentage of them seem to be run by the English, another reason not to spend too long in Cairns City itself. 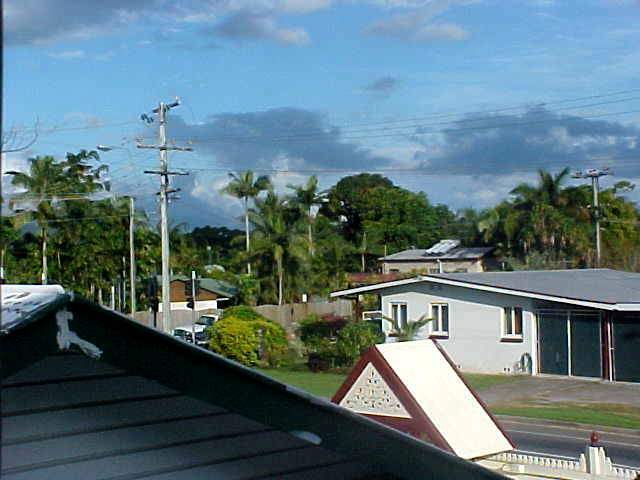 Tomorrow it will be officially winter in Australia, but the temperature in Cairns is beautiful warm. In summertime, like in December, it is supposed to be sizzling hot here. With weather conditions that make you sweat with whatever you do. I had a walk around the city and ended up on the green grass of the Esplanade again. Who just walked by? It was! 350 kilometres from where we first met up last Saturday: Vivianne! After staying on Magnetic Island she and the other Dutch lady Barbara moved on to Cairns on Sunday. While Barbara was on a 3-days diving course, Vivianne was exploring the city. What a coincidence! We caught up with each other�s adventures and I soon found out that she was living life with daily hangovers, caused by Cairns (at last) exciting nightlife. 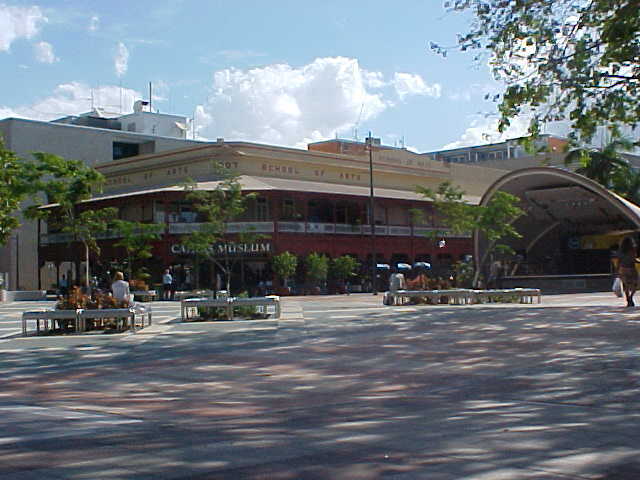 Cairns is a starting point and finish point for lots of young travellers. Many people, like most of the British, only travel up or down the Australian East Coast. Barbara will be returning home in a few weeks, but Viv was going to Alice Springs and Adelaide soon. Maybe I will meet up with her again! At 4pm I met up with my new hostess, Anne Falconer, and I said goodbye to Vivianne. Anne took me with here to her home in the quiet suburb of Edge Hill (guess what, it�s on the edge of a green hill). In the car she explained me her family situation. 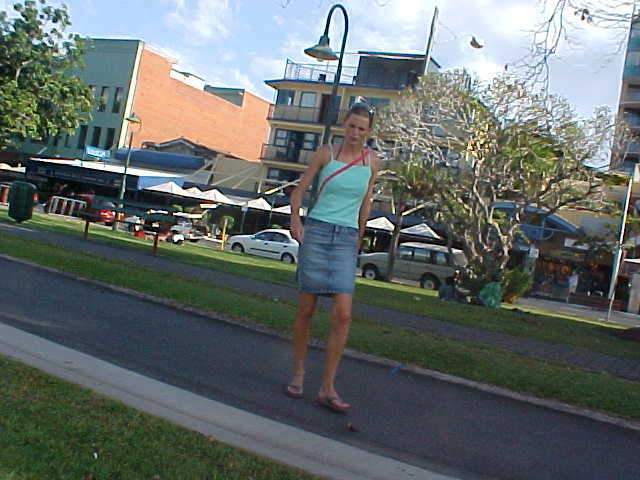 Anne is originally Newzealander and when she came to visit Cairns some 18 years ago, she totally fell in love with the atmosphere of this town that she decided to stay. She is engaged with the European Jean-Pierre and has a 13-year-old daughter Brianne from an earlier marriage. Anne herself is a teacher at the Edge Hill Primary school. 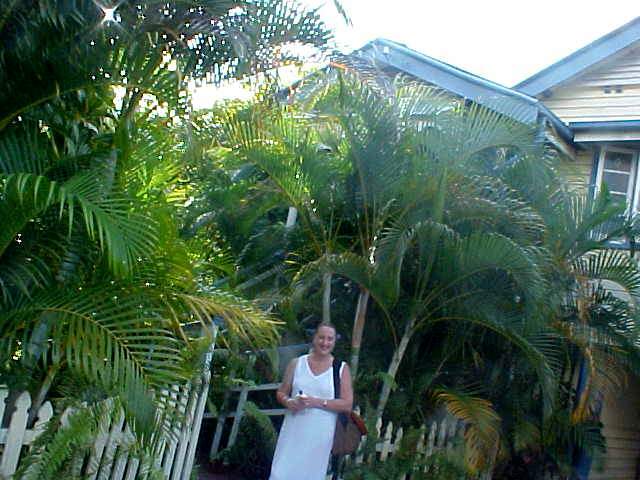 At her home the beauty of her Queenslander house she lives in charmed me much. I also met up with Brianne who just came home from school. I dumped my stuff in my own guest bedroom and had a big glass of ice water to rehydrate from the tropic heat. Boy, I needed that! I also had a one-hour nap to get back on the energy I lost in the four-hour drive to Cairns. 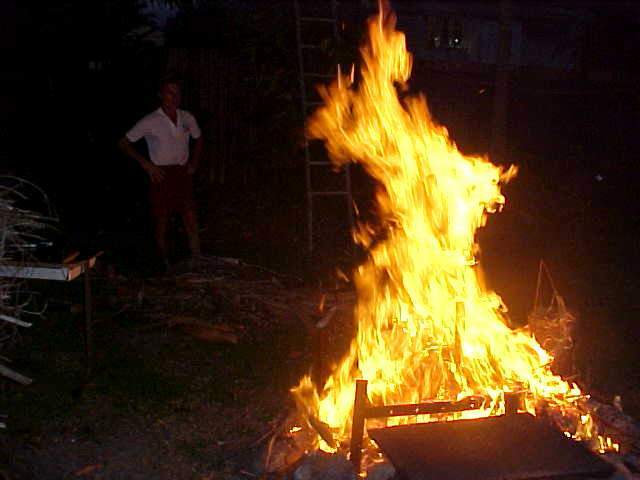 Around six I met up with Anne�s partner Jean-Pierre, who was starting a big fire for tonight�s BBQ party in the back yard. 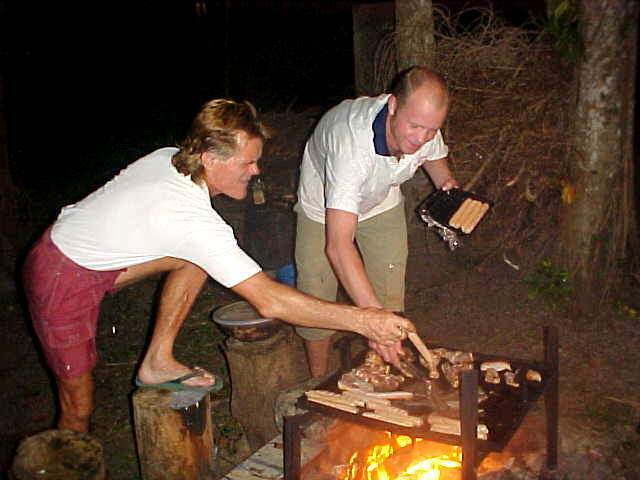 Their garden has a huge tree, providing enough rubbish and branches for several big BBQ�s per year. Anna had invited her cousins and nieces to eat along and they soon showed up with their eskies filled up with meat and beer. 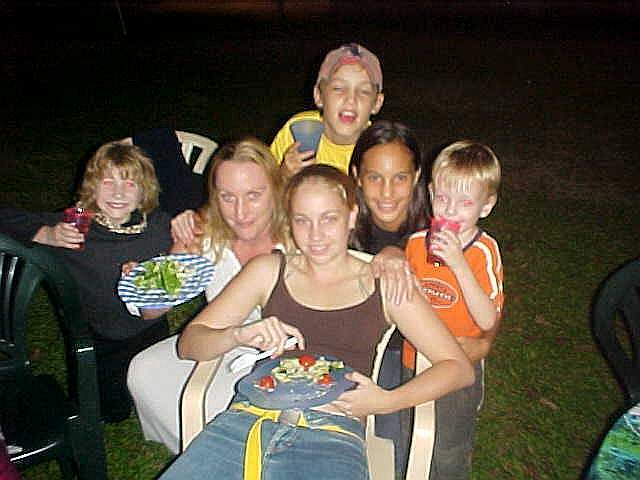 It was Brianne who had read an article about me in the Courier Mail in March and who invited me over under her mother�s name. Since then Anne has been receiving my e-mail updates and was expecting me in Cairns pretty soon. With the barbecue going on outside, Brianne and her niece Bryone, were doing their nails in the living room while watching popular youth-television shows. 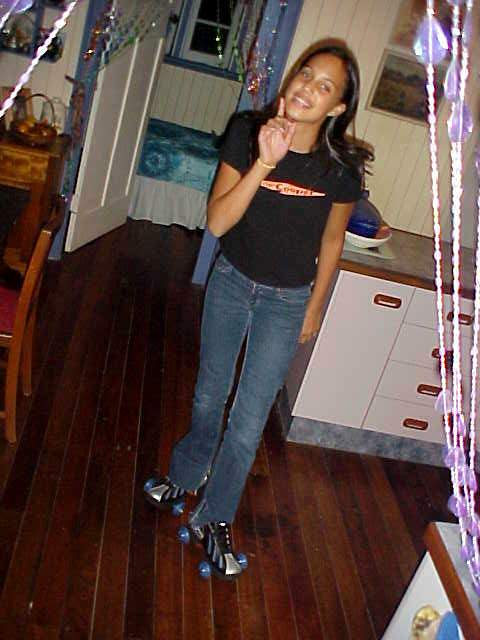 Bryony, als a born Kiwi, was amazed by the skate-shoes had got today and she was skating through the house with them! She desperately wants a pair of these shoes too. �They are sooo cool,� she said. I told her to write an e-mail to Aircoast in Malaysia and ask them how to obtain them (you never know what happens). Outside I ate beef, chicken and sausages and had to tell the family about my project and about the Netherlands. 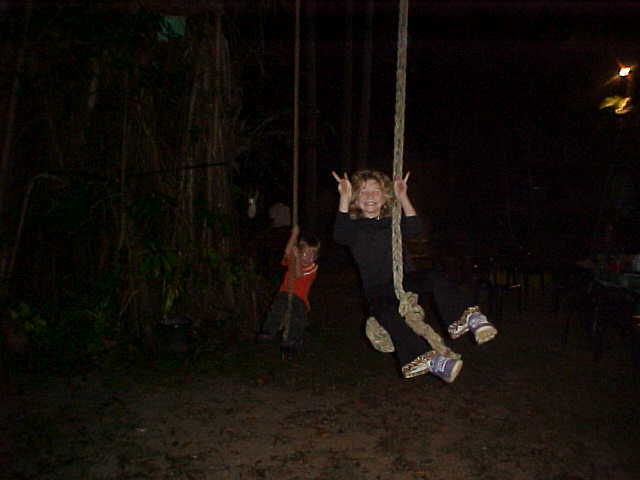 Meanwhile I gave lots of attention to the kids, who loved me for pushing them on the long ropes attached to the tree. Then suddenly Anne got her guitar out and started to sing songs on it. She sang original Newzealand songs, some Polynesian or Maori (Pacific Island's culture), some French songs and even a Dutch one! The rest of the family sang along too and the kids provided the action with some Mauri dancing. 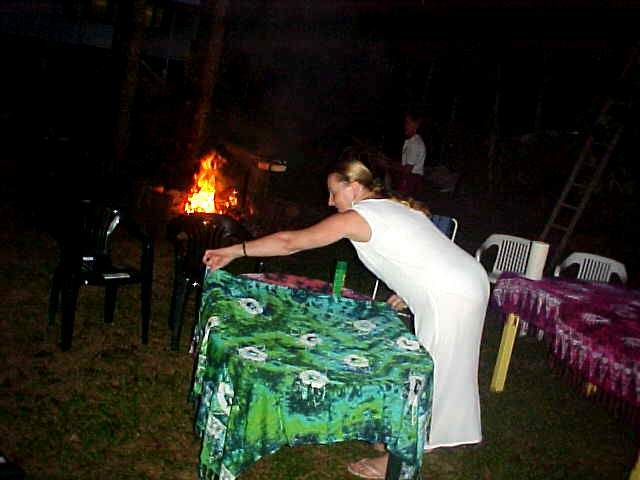 The vibe was great and the only light came from the barbecue fire � mmm! It was about 10.30pm when Anne let me use her Internet connection to let me do some updates on this website. Slowly most visitors took off, as they all had to work tomorrow. With this day in Cairns almost over, Anne told me to come back here anytime again. 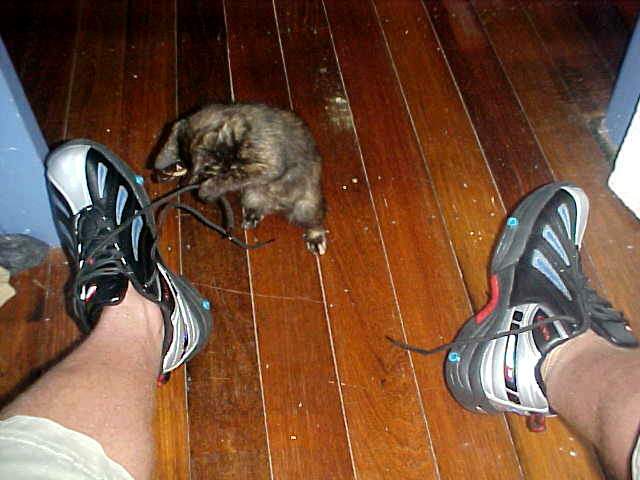 Brianne and Bryony were excited about that too, as I could visit Brianne�s school and let Bryony use my skate-shoes, haha. 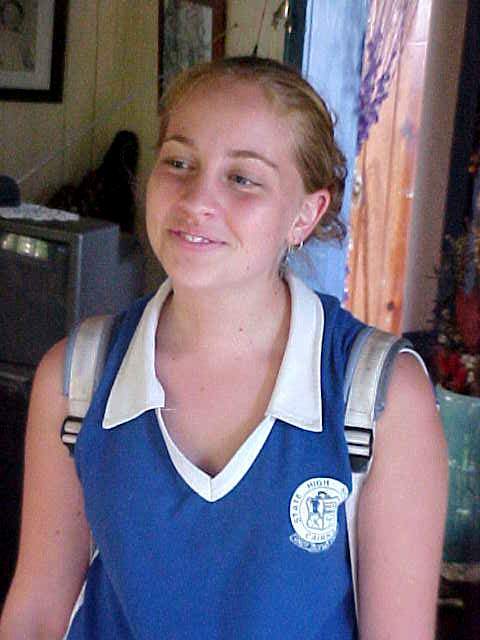 [b]Tomorrow I was going back to Townsville again, where I will be staying again with Julie Brice. Tomorrow will also be the day my new laptop (yeah!) will arrive! When that writing equipment is completely functional again, I�ll slowly travel up north again to coming few weeks. How are winter days in Mission Beach?